Another weekend is upon us and I'm sure there are plenty of people everywhere looking to get out and fish a bit. The football playoffs will help limit crowds although the weather will also play a part to accomplish the same goal. The best temperatures we expect over the next week look to happen on Monday. With long term forecasts suggesting that highs after Monday will struggle to get above freezing, this weekend will be your best opportunity to get out and catch some trout. 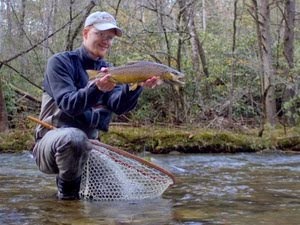 In the Smokies, expect the cold weather to keep things tough but not impossible. 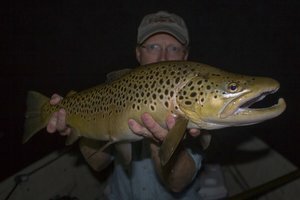 The larger browns and rainbows will still be looking to eat. 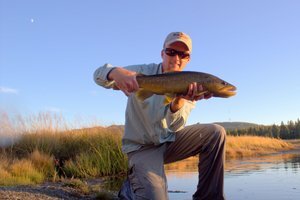 Most days will produce the best fishing after the sun has had a chance to nudge the water temperatures even a degree or two. The actual temperature is not as important as the temperature's general direction. 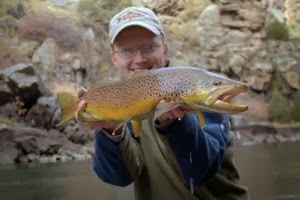 The big browns will probably be willing to chase if you feel like tossing streamers. Use heavy tippet and hold on. These days will feature long hours and your reward may only be one fish. 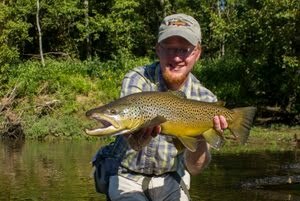 When that fish has the chance to be over twenty inches it makes it all worth your time. I'm hoping to be out fishing on Sunday chasing either trout or maybe even musky. Hopefully there will be a report and pictures to follow soon!